A Japanese judge has ruled that three companies reselling R4 flash carts must pay $1 million in damages to a group of 50 games publishers. Nintendo Japan announced this morning that its ongoing lawsuit against resellers of R4 flash cartridges has resulted in a judge ruling that three Japanese retailers must pay Nintendo and a group of 49 other publishers a total of Â¥95,620,005 in damages. For those of you without handy yen to dollars conversion tools, that works out to roughly $947,211.77 USD. Unfamiliar with R4 carts? The key thing to know is that they make piracy on consoles which utilize cart-based games much, much easier. 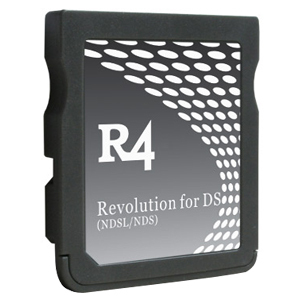 Without getting too deeply into the details, the R4 carts effectively serve as miniature hard drives on which any number of games can be stored. Since they're created specifically to work in modern gaming machines (most notably the Nintendo DS), these R4 carts can then be inserted into your handheld of choice, thus giving users access to basically any game ever created without having to pay any pesky retail prices for the entertainment. You can probably see how this might upset companies that make money by releasing games for these machines, and how it would displease Nintendo in particular. While Japan outlawed such flash carts in 2012, some companies still stocked them, and were freely selling them to anyone with the appropriate amount of cash. This is what spawned the lawsuit in the first place, though it's unsurprising to see this result given that the plaintiffs in this case consisted of almost every major Japanese gaming company in existence. With that much financial and political clout, there was never much doubt as to what the outcome here might be. Still, propers to Nintendo et alia for smiting such a prominent foe and striking a decisive blow in the fight against piracy. Of course, with humans being the lazy, greedy animals they've always been, the scourge of gaming piracy is going nowhere any time soon, so this victory is more Sisyphean than anything else. Eventually the giant rock of piracy will tire Nintendo out, but until then the company is dedicated to pushing that stupid boulder up that stupid hill as many times as necessary.